I found some old pictures in one of my Evernote notebooks. It was of chicken and dumplings I made for my mom and I last Winter. My mom had a taste for her childhood favorite dish and it was the perfect excuse to pull Lucille down from her throne. I almost forgot where I got the recipe but after digging through my crockpot recipes on Pinterest,I found the recipe. I found it on Spend with Pennies and what I really liked about it was that there was a shortcut to making the dumplings. I know that many folks like to do EVERYTHING from scratch,and while I admire that,it’s definitely not me. I like layering ingredients into Lucille and that’s pretty much all you’re doing with this recipe and there aren’t a gazillion ingredients either. If you decide to make this, please let me know by dropping pics of your creation in the comments here, or on Twitter using the hashtag #mommyincolorcooks,or on Facebook. Enjoy! Add onion to crock pot and top with chicken breasts. 2)In a small bowl, combine cream of celery soup, cream of chicken soup, parsley, poultry seasoning and pepper. Spread over chicken breasts. Top with chicken broth and cook on high 5 hours. 3)1 hour before serving (after 4 hours of cooking time),cut biscuits into thin and flat strips. Add vegetables to the slow cooker and stir. Add biscuit strips on top. Replace lid as quickly as possible. When serving,take chicken breaks out if crockpot and slightly shred. Put back into slow cooker and stir (the dumplings will break apart,its fine). Let cook an additional 10 minutes and serve. I made this dish originally 8 months ago so I’m fuzzy on details. However, I remember loving the biscuits serving as dumplings. If done just right they can be crisper on top while keeping its roughness. It was also very hearty and filling. I believe I added a little salt to taste because it tasted a little bland at first. I’m not sure of the serving size but I made it for just me and my mom and we had leftovers for the next 3 days or so. Next time I make it, I will livestream it from Periscope. Once agajn,enjoy!!! After the successes that were my split pea soup and honey mustard pork chops, I decided to kill two birds with one stone:an affordable meal in the crock pot I am obsessed with. This one was super easy because you probably already have a technique you use to make meatballs. I have never made meat balls prior to this. My mom usually makes them for our subs or spaghetti dishes but I wanted to not only try it myself, but put my own spin on it. Pinterest once again was my hero and this recipe is from Le Creme De La Crumb. 1.I cut the string cheese sticks into 8 pieces each. I used 5 sticks. I had 17 meatballs in total. 2.The ground beef was hand mixed with the bread crumbs,eggs,garlic powder,onion powder,Italian seasoning,salt,and pepper. My beef was still a tad frozen so mixing it up with the heat from my hands helped thaw it some. Meanhwile the cut cheese stick were in the freezer.. I actually enticed Amani int helping me roll the beef into balls. We stuck the cubed cheese into the meat and made a ball around it to cover the hole and cheese. 3.I actually enticed Amani into helping me roll the beef into balls. We stuck the cubed cheese in the meat and made a ball around it to cover the hole. 4.Before I put the balls in Lucille, I sprayed her with nonstick spray. I gave the balls enough space in between them to breathe. I am still getting used to Lucille’s temp settings so I put her on high for 3 hours but the recipe says low for 3 hours,high for 1-2. I panicked a bit but am happy to say all was just starting too ooze out. It was so good! As I said, I made 17 balls in total split between 4 people. The recipe does serve 4-6 people. I did make my meatball medium sized because it was the 4 of us. It;s an appetizer but one full of Italian flavor! I was perfectly content simply eating as a stand alone treat. I will definitely be making these again in my spaghetti and even perhaps sub sandwiches. Amani did top hers off with romano cheese while I added a little more Italian seasoning to mine. I am going to give this recipe 10/10 for affordability,taste,and time. I strongly encourage you to give it a try. I would love to see how you hook yours up so do tag me at #mommincolorcooks. Happy eating yall!!! 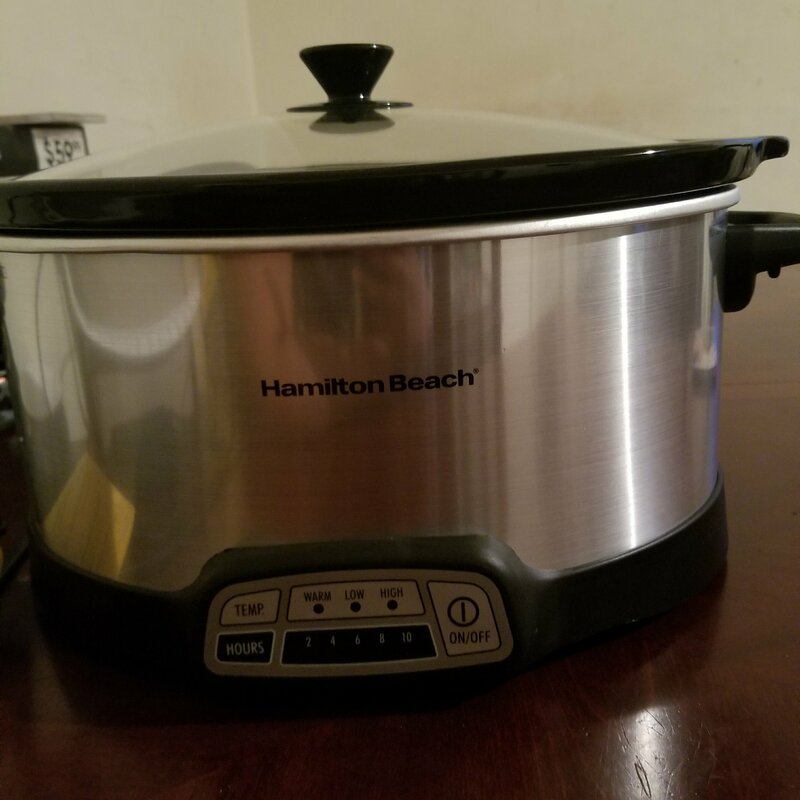 Those of you who follow my Instagram account, know that this past weekend I was gifted with my very FIRST slow cooker. I have decided to name it Lucille, a moniker I have to a favorite pen I had in 8th grade. Actually, I named the pen after the Little Richard song ‘Lucille’,after I watched the Little Richard biopic,starring a favorite of mine, Leon 😍😍😍. But, I digress. I CAN’T WAIT to make my first slow cooker meal and so I got Pinterest and found quite a few I want to try. But one that stuck out to me was actually one I had seen done by my favorite television chef, Ree Drummond AKA The Pioneer Woman. It also just so happened that my mother mentioned that she had a taste for homemade lasagna,and then I got the slow cooker,all in the same week. Talk about fate,huh? Without further ado, here is the recipe for slow cooker lasagna. Enjoy! For the meat mixture: In a large skillet over medium-high heat, add the olive oil and onion and saute for 5 minutes. Add the ground beef, sausage and garlic and cook until brown, 7 to 9 minutes. Add the tomatoes with their juice, tomato paste, basil, parsley, oregano, salt and some pepper and stir. Set aside. For the cheese mixture: In a medium bowl, combine the ricotta, Parmesan, Romano, basil, parsley, salt, pepper and eggs and stir together well. For the lasagna: Spray a 6-quart slow cooker with cooking spray. Spoon in one-quarter of the meat mixture on the bottom and top with 5 lasagna noodles, broken to fit. Add a third of the cheese mixture, then sprinkle with 1/2 cup mozzarella. Repeat this layering twice, starting with the meat mixture and ending with the mozzarella, for 3 layers total. For the fourth layer, top with the remaining meat mixture and remaining 1/2 cup mozzarella. Cover and cook on low for 4 hours. Turn off the heat and allow the lasagna to sit 30 minutes before serving. Sprinkle with chopped parsley.